Who’s filching the feathered folk of the city? Pigeon P.I. is taking it easy; his partner, Stanley, has flown the coop, and the gumshoe has closed the detective agency. Around town, brightly colored birds are vanishing, but the sea gull police force is far more interested in a downed box of doughnuts. 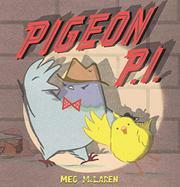 Vee, a plucky canary whose birdie buddies have gone missing, wants Pigeon P.I.’s help, but he’s reluctant. She’s determined—very determined—and he takes the case. There are no leads until Vee joins the disappeared. A clue points to the Red Herring Bar and Grill, where P.I. finds the whole flock and frees them. But who’s behind the nefarious birdnapping? Pigeon P.I. hears a familiar voice and makes a startling discovery. With the thief exposed and caged, Pigeon P.I. decides he’s found a new partner; and he and Vee found the Bird’s Eye View Detective Agency. Scottish author McLaren’s picture-book tale is just the ticket for budding detectives. They can follow the feathers along with Pigeon P.I. through the digitally created panels and full-bleed illustrations, both dotted with speech bubbles. The watercolor-appearing pictures, full of expressive fowl of various species, are charming and replete with visual gags and additional jokes for the observant or more experienced readers.